When you stay at Vilamar in Lagos, you'll be next to a golf course, within a 15-minute drive of Meia Praia Beach and Lagos Marina. This family-friendly hotel is 5.6 mi (9 km) from Porto de Mos Beach and 5.7 mi (9.2 km) from Dona Ana Beach. 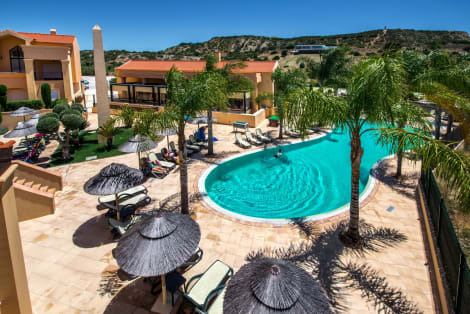 This enchanting complex features a unique situation just a few steps from Praia da Luz's beautiful sandy beach and offers stunning views over the sea and to the surrounding mountainous landscape. Guests will find themselves some 6 kilometres from the old town of Lagos, full of character and a must place to visit. Ranging from spacious rooms to fully-equipped apartments, the hotel's accommodation units have been designed to guarantee a comfortable night's sleep and a relaxing stay. They all have been decorated in warm colours and include a private bathroom for guests' convenience. In the outdoor area, visitors will find 4 magnificent swimming pools surrounded by sun decks and chairs, and those wishing to enjoy a unique moment of relaxation can visit the sauna and Turkish bath. The onsite dining options include a buffet restaurant serving delicious specialities as well as a bar. This family-friendly beach hotel enjoys a fantastic location, just 50 m from the beach and 100 m from the resort centre of Praia da Luz, where guests will find numerous restaurants, bars, nightlife and shops. The popular, cosmopolitan town of Lagos is approximately 5 km from the apartment hotel, as are links to the public transport network and San Antonio Church. Lagos Zoo is around 14 km from the beach hotel, Sagres is roughly 30 km away, and Zoomarine is some 40 km away. Faro airport is approximately 85 km from the hotel. These beach apartments are suitable for couples and families in search of peace and relaxation in brand new surroundings. The 22 spacious, modern and comfortable apartments are well run and offer high standards of quality and service. A car park is available for guests arriving by car. The accommodation is composed of studios for two adults and one child. One-bedroom apartments are suitable for three adults and one child. Each apartment features a full en suite bathroom with a shower and bathtub, a kitchen with 2 electric rings, a fridge, toaster, kettle, microwave and cooking utensils, and a private balcony or terrace. Other amenities available to guests in the apartments include satellite TV, air conditioning, a telephone and a safe. The sport and leisure facilities and services include an outdoor swimming pool with children's swimming area and a sun terrace with sun loungers and parasols. Sun loungers and parasols can also be hired for a fee on the nearby sandy beach. lastminute.com has a fantastic range of hotels in Praia Da Luz, with everything from cheap hotels to luxurious five star accommodation available. We like to live up to our last minute name so remember you can book any one of our excellent Praia Da Luz hotels up until midnight and stay the same night.